Today is Day 3 of my Green Smoothie adventure﻿! My wonderful hubby is totally on board with the Green Smoothies and he even bought us the high tech Blendtec Blender. This is the same one that Robyn used during her demonstration at the workshop I attended. 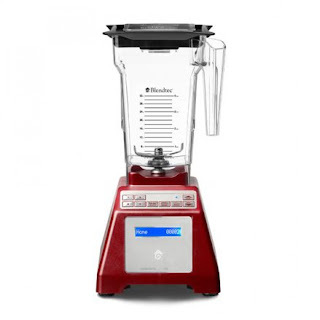 I have to say that there is no contest between this wonder machine and the blender we used before. Today I used 3 kale leaves, 2 red chard leaves, 2 collard leaves, a cup of spinach, an apple, carrot, 1/4 c each of raspberries and strawberries, 1 1/2 banana, 2 tbsp flax and 2 tbsp of organic flax, and the result was amazing! We each had 30 ounces and my daughter had about 8 ounces, they were so delicious and easy to drink. It was so smooth and creamy with no "chunks" of the greens or the fruit. I am 100% in love with this machine, which for me is rare, I'm not big into these kinds of things. My goal is to make Green Smoothies a daily habit for us. The benefits are endless, getting in 10-15 servings of fruits and vegetables with each smoothie, getting better digestion (which I can attest to, even in the 3 days), more satiety and fullness for longer, more energy during the day and less cravings for sweets and white carbs. I want to spend a minute talking about the more satiety topic. This is important if one of your goals is weight loss. When you fill up on these nutrient dense raw whole foods you are less likely to eat other foods that are not as good for you or your waistline. I had my smoothie at 8:00 am this morning and 2 hours later, I am still full and don't find myself reaching for a morning snack, which usually I do. Another benefit to Green Smoothies is that when you have your Green Smoothie first thing in the morning you are starting your day with a good habit that you are likely to carry into the rest of your day. If you pack a lunch for work, make a little extra smoothie to take with you and sip it throughout the day to curb cravings or eat it with your lunch, or if you like most Americans hit that 3:00 energy slump. Robyn's challenge was to drink 36 ounces of Green Smoothie everyday. I am almost there, and this is a habit that I intent to keep. My challenge to you, add a Green Smoothie into your daily habit. There are tons of recipes that you can use as a starting off point to be creative and make your own Green concoctions. If you find one that you love please share in the comments section and I will re-post it. I hope that you will continue on this Green Smoothie adventure with me!